🆓RECORD & RECOGNIZE is MP3/WAV audio recorder has some filters. 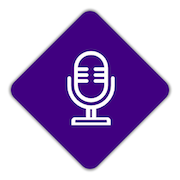 Speech to Text is using IBM Bluemix Watson Speech to Text service. 🎉Ver.2.3.0 that can view transcripts like timeline is ready to download. Localized to Portugal, Russia, Italy, Hindi. In this version. Whole UX has improved but basic function is same. In addition, some minor functions added or improved. Inside, Almost codes has been migrated from Objective-C to Swift. First of all, “Void” name has changed “RECO&RECOG”. Ver.1.14.0 is localized to the Korean and Japanese. Ver.1.13.0 is localized to the Chinese Simplified, Chinese Traditional. Enjoy! New version of the Void has been release. It has a new feature. Record & Transcript – Void Ver.1.11.1 has released which include a bug fix. It was wrong display layout of the effect view.